Adopted by a nice family with three daughters! 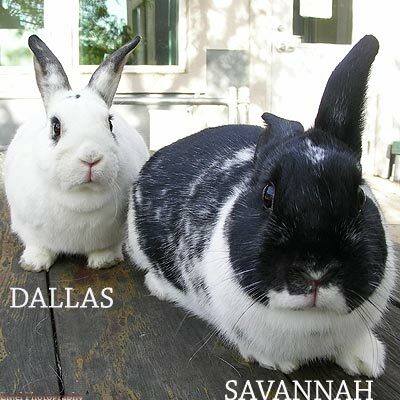 Savannah and Dallas are bonded rabbits, but I know they are really little pixies! Last weekend at Oakland Animal Shelter, they magically escaped from their exercise pen TWICE and were hopping around the patio gleefully, showing off their magical trick. These two rabbits are perky, but loving and gentle. And they do such a great job of keeping each other company! Dallas and Savannah are WONDERFUL rabbits - they love each other completely and are sweet and gentle and are waiting for someone to love them and bring them home! Dallas and Savannah are both fixed, so you can take them home the same day, if you fall in love! Be sure to check out their video and more photos!